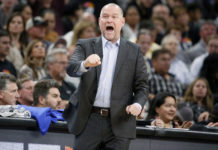 The Denver Nuggets season did not finish exactly the way that they wanted it to as it took an improbable comeback against a depleted Minnesota Timberwolves team for Denver to secure the second seed in the Western Conference, but what a spectacular year it has been for this Nuggets team. Denver has had to overcome so many obstacles and they have now finally ended their six-year playoff drought after they finished with a 54-28 record, which is one of the best seasons in franchise history. The stage is now set for Denver to face-off against the seventh seeded San Antonio Spurs which is no easy task. The Spurs have DeMar DeRozan, LaMarcus Aldridge and legendary head coach Gregg Popovich. 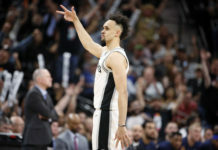 Denver dropped game one to the Spurs 101-96 and now they have to steal a win in a hostile San Antonio environment if they want to get out of the first round of the playoffs. With that, I give you the good, bad and ugly. Denver lost the game, but it was more so about what the Nuggets did wrong rather than what the Spurs did right. Denver could not knock down any shots and, for as rough of a start that the Nuggets had in the first half, it was still encouraging to see that the Nuggets still in the game until the final shot. Denver used a big second half — that was kick started by their defense — to rally and almost steal the victory. Denver had their best quarter of the night in the third quarter. Denver limited the Spurs to only 13 points and fought back in the game numerous times. 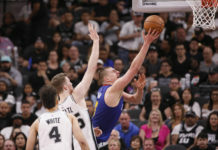 Nikola Jokic was a bit passive in the first half, but picked it up in the second half and eventually finished with a triple-double in his first playoff game. Jokic had 10 points, 14 rebounds and 14 assists and continued to find the open man despite Denver not being able to hit shots. Two other bright spots was the play of Gary Harris and Will Barton. Both players have been up and down since returning from their injuries but played well in their first playoff games. Barton finished with 15 points and also recorded 10 rebounds showcasing that he could be the X-factor Denver needs if they plan to advance. Harris hit some timely shots and took over in the fourth quarter to get Denver back in the game. He finished with 20 points and made some great plays on defense as well to keep Denver in it. If the Nuggets are able to get the same type of production from these three players again with a more aggressive Jokic and Jamal Murray, Denver will most likely roll in the next game and then use that momentum to hopefully steal a game in San Antonio. The funk that the Nuggets were in offensively to end the regular season carried on into the playoffs. The Spurs did a good job of giving Denver different looks as they sent double teams Jokic’s way and forced the ball out of his hands. San Antonio also used some full-court defense to force the Nuggets to set up their half-court offense quicker. The Spurs did not allow a single fast-break point, but ultimately it came down to shots not falling. Denver got plenty of open looks, but could not get anything to fall which led to Denver heading into the second quarter with a five-point deficit. The Nuggets could only muster 20 points in the first quarter while shooting only 29 percent from the field and, to make matters worse, the Nuggets shot an awful 1-9 from beyond the arc. Denver picked it up in the second quarter offensively as they were able to find their rhythm and score 34 points, but still struggled with their outside shooting. Denver went into halftime down 59-51 after shooting 2-13 from the 3-point line. It is extremely difficult to beat a team with no outside shooting and even more daunting of a task in the playoffs. 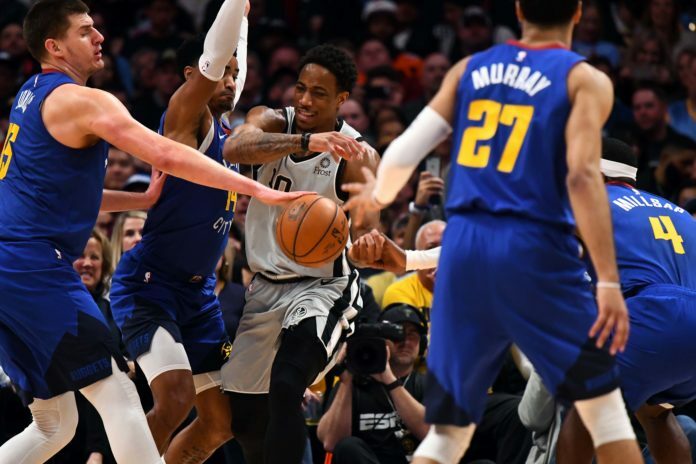 The Nuggets will have to get off to better starts if they plan on getting any wins at all; especially against a team like the Spurs who attack weaknesses so well. Denver had plenty of opportunities to keep homecourt advantage with a win despite Murray — who went 8-24 from the field including the late game mid-range miss and also being stripped by White in the final seconds — not having a great shooting night. The Nuggets did exactly what they had to do on both ends of the floor other than make shots. They contested shots, limited Aldridge and DeRozan’s production, and made the extra pass for open shots. Denver just could not hit their open shots and that was the difference in the game. Denver typically responds well in these types of situations. Now, with the Spurs stealing a victory, Tuesday’s game is now the most important game of the year for Denver.